As marble installers and refinishers, we often are called in to make marble shine again. Sometimes this requires nothing more but items you can buy in a home improvement store. Other times, we need to use professional equipment. Marble polishing is not always so difficult that it requires professional services. Depending upon what type of marble you have, and the condition of the marble, you may be able to do your own marble restoration. The first question we would ask anyone who is deciding whether or not to do their own polishing is whether or not they are looking at solid marble or cultured marble. When working with a cultured marble, marble polishing can be pretty easy with the right products and equipment. Cultured marble is very easy to sand. In fact, you can sand down most light scratches and stains on cultured marble with either 1,000 grit or very fine sand paper. Lightly buff the surface until you see a very fine powder and if you remember not to go too deep or hard with the sanding you should end up with something you can work with. Once you're done sanding, wipe clean with water and then seal with silicone or a cultured marble polish. Naturally, you shouldn't attempt to sand any deep scratches on your own or risk ruining the surface of the marble. We use special equipment and finishing products when we need to remove deep scratches. You will likely not have access to these, or if you could purchase the equipment, you will find that it is just not cost-effective for the incidental scratch. We do this daily for clients all over the area. 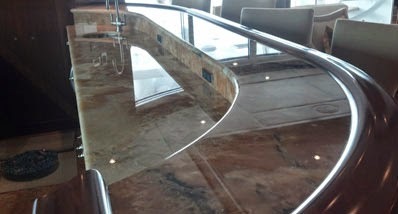 Here, at Classic Marble Restoration in South Florida we love working with this product. It's beautiful, unique, but, unfortunately, delicate. It is that delicate nature that should give people pause when sanding – as too much sanding with the wrong sealants can make the marble even more prone to stains and scratches. Before attempting to polish the marble on your own, be sure that you are looking at the surface damage, and not something more deep and requiring professional services. If the stains and scratches are minor, remember to use light sand paper and a good silicon-based polisher and you should be fine doing it yourself.